Abstract: Ledger books from Brookhaven Town’s early days that had been unavailable to the public for nearly a half century were recently located by John Strong in the Huntington Library in San Marino, California. The ledgers show significant cultural interactions between Unkechaug Indians and settlers. The focus of this first article is on the earliest ledger. This ledger records references to tax rates, transactions between settlers related to whale oil and baleen and the “lay” system of payments in kind to the Unkechaug Indians for their labor. The goods extended to the Indians were itemized, providing insights into the changes in the Unkechaug material culture during this period. The ledger also demonstrates how lucrative and important the processing of oil and baleen from the North Atlantic Right whale was to both groups of inhabitants. Note:This article is based on a paper given by Lamont and Strong at the Native American and Indigenous Studies Association (NAISA) conference at Mohegan Sun, Uncasville, CT June 3-6 2012. We thank the Fire Island National Park administration for purchasing digital copies of the ledger books from the Huntington Library in San Marino, California. Two important seventeenth century ledger books recently came to the attention of the authors. They were discovered in the Huntington Library Archive in San Marino, California (cited herein as RFL 1 RFL 2). The entries in RFL 1 date from 1686 to 1690 and RFL 2 from 1721 to 1732. The former had been described briefly in an article written by Kate W. Strong in 1957 and published in the Long Island Forum. She believed that it was a record of accounts kept by Richard Floyd beginning in 1687. According to the Huntington Library records, shortly after the publication in 1957, a man named Charles Hamilton obtained both ledgers and sold them to Frank Seibert, the Algonquian linguist. They remained in his private collection until he died in 1998. His family put them up for auction at Sotheby’s the following year. The Huntington purchased them in Sale 7315, lot 115 on May 21, 1999. They were attributed to Richard Floyd of Brookhaven, who was identified in Sotheby’s records as a “merchant from Long Island.” The assumption that Floyd was a merchant was based on the entries in the ledgers listing the names of Indians and the early settlers of Brookhaven. A third ledger, also attributed to Richard Floyd, had been residing quietly in the archives of the Suffolk County Historical Society in Riverhead, New York for years (cited as RFAB). This ledger, recently brought to the authors’ attention by Ned Smith, the archivist for the Historical Society, covers the period from 1687 to 1691, nearly the same years as the earliest Huntington ledger (RFL 1). The second Huntington ledger (RFL 2) kept by the Floyd family may have been a merchant’s account book recording sales to customers as well as a record kept by Richard Floyd Jr., listing the payments in kind to Unkechaug men who worked for the Floyd family. This article will focus on questions of authorship and the historical significance of RFL 1. The other two ledgers will be discussed in a subsequent article. The ledgers share much in common with colonial documents from the mid-seventeenth century. The paper would have been imported from England because paper making did not begin in the colonies until late in the century. The high rag content used in the manufacture of paper at the time played a role in the preservation of these documents. Impurities in the paper caused some of the spotting, but the more distinct blotting was a result of the sharp points on the quill pens which often penetrated the surface of the paper. The ink was made from galls on oak or apple trees made by gall flies, mixed with copper sulfate or iron salts in large wooden tubs and stirred for two or three weeks. A binder of sap or tree gum was then added. This ink was a dark purplish color that eventually took on the brownish cast evident in these ledgers. The handwriting, punctuation, and spelling in the colonial period was not standardized and is often a challenge to interpret. RFL 1 is a small sixty-two page leather bound book eight inches long by two inches wide with the front cover missing. Entries were made on both sides of the pages. The pagination for RFL 1 and 2 was established by the Huntington archivist when the copies were digitalized. The reverse sides of each page were marked with a “v.” Page two, for example, is followed by 2v and so on. Upon closer examination, the authors noted that the first entry was 1686 not 1687. More importantly, they concluded that it was unlikely the ledger was Richard Floyd’s personal account book. The first Richard Floyd (1620-c. 1700), and progenitor of the family on Long Island is first recorded in early Brookhaven Town Records in 1667. He could not write and made his mark with an “R” or an “X” on many of the Brookhaven Town indentures, the last of which was dated 1695. His son, Richard Floyd Jr. (1665-1738) was fully literate and lived, for part of his long life, on the Pattersquash farm along the creek of the same Indian name in Mastic. He purchased the farm in 1684. Samples of his handwriting in the archives at the Floyd Estate match many of the entries in this ledger. The hand writing of Richard Smith Jr. has also been identified, using the primary documents in the Floyd Estate archives, the Brookhaven Town Historian’s office, and the Suffolk County Historical Society archives. Along with the writing of the younger Floyd and Richard Smith, an unidentified man made entries appear in the book. He is likely to have been William Satterly the tax collector who died in office early in 1688 or late in 1687. Satterly was replaced in 1688 by John Roe. Roe, who along with a majority of Long Island settlers in the seventeenth century could not write, signed with a characteristic capital “R.” His mark was easily identified on page 33v acknowledging his receipt of fifty-five shillings from Richard Floyd Junior on April 21, 1688. The receipt itself was written by Floyd who had Roe affix his “R” at the bottom. Ned Smith, the archivist for the Suffolk county Historical Society, also concluded that RFL 1 and RFAB were unlikely to have been Richard Floyd’s personal accounts. The ledgers were more likely to have been, as Ned Smith suggested, the record of whaling company stockholders or, perhaps, a public account kept to supplement the official town records. Both interpretations would account for the different handwriting in the ledgers. There are references to tax rates in the ledger for the county, the governor, and to support the parson. Two of the tax entries, both undated, credit Timothy Brewster with “making the county rate,” and the third, mentioned above, is a receipt acknowledging that John “R” (Roe) received the “full satisfaction” of money for taxes from Richard Floyd Jr. These entries would be consistent with town or county records. The connection of the ledger to the whaling enterprise is underscored by the payments in kind to Indians and to an entry noting three “company charges.” One was for rum “given the Indians,” the second was an entry noting that Richard Smith owed sixteen shillings, four pence to “the company charge,” and the third was a charge of three pounds “for warps.” The “warps” probably referred to the rope for the harpoons and for other uses related to the whaling operations. 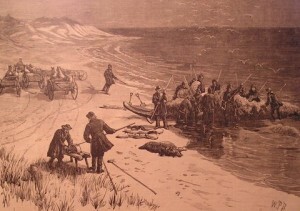 Whaling off Long Island, illustration by W.P. Bodfish, c. 1870. Collection of the Southampton Historical Museum. Try pot furnace (outdoor replica). Collection of the Southampton Historical Museum. The number of names in the ledger, however, is puzzling. There were thirty-two men mentioned and no indication of any organizational structure. The whaling company contracts in the town records from 1670 to 1685 generally name two or three “associates” in the company. “These small partnerships,” noted historian T. H. Breen, “provided local men with a way to share costs as well as risks. There are many references to individuals involving credit and/or debt for items such as pork, corn, duffel cloth, wine, nails, and labor. It is possible, of course that the men most frequently mentioned such as Richard Floyd (6) Richard Smith (3) Samuel Terrill (3) (Timothy Brewster (4) and William Joan (Jayne) (5) were the primary investors who had temporary business arrangements with the others. Three of these men, Richard Floyd, Joseph Davis, and Samuel Terrill, had previous experience in shore whaling companies: Floyd in 1685, Terrill in 1675 and in 1679, and Joseph Davis in 1683. Five of the thirteen Indians named in the ledger were veteran whalers. Chesen had hunted whales for Andrew Gibb in 1682. John Indian hunted whales for three seasons from 1679 to 1682 and Meneges (Monogos) hunted for John Tooker of Brookhaven in 1685. Weis (Weeis) had been hired by John Cooper of Southampton in 1681, and Pemshan (Pemeson) was a member of a whaling crew hired by James Loper of East Hampton in 1675. Samuel Terrill was one of the witnesses who signed Pemshan’s contract. These entries are significant because they document the flow of whale oil to New York and the payment of a fee contrary to the oft repeated assertions that oil from the Long Island towns was sent to Boston to avoid paying the governor’s taxes. This is not to suggest, of course, that tax avoidance was uncommon, but only that the charge may have been somewhat exaggerated. Other entries are less clear. On page 5v, for example, there are three entries separated by lines across the page listing Richard Smith as a “deter” (debtor). The first, dated April 25, 1688, is for “16 barrels of whale oil,” the second is for one barrel of oil and one hundred and twelve pounds of bone and below that a “company charge” of sixteen shillings and four pence, dated March 23, 1688/89. The following pages record transactions between Smith and Samuel Muncy involving whale oil, bone and other commodities and between Smith and Samuel Terrill in May, 1689 listing oil and corn. Further research with related documents from the period may shed some light on these entries, but the references to the processing and shipping of whale products underscore the continuing importance of these commodities in the economy of eastern Long Island. The ledger also provides a window into the interaction between Native Americans and the English settlers during the last decades of the seventeenth century. A careful look at the entries involving the Indians indicates that goods were given in exchange for labor on a “lay system.” The sparse amounts of currency available in the colonies during the decades following the English settlement on Long Island made such commodity exchanges a common practice. Farmers, for example, often paid their debts with produce. What set the lay system apart, however, was that the Indians were often at a disadvantage in an economy dominated by the English. The first economic interactions between the Indians and the English settlers involved land transactions. In these negotiations during the 1650s and 1660s, the Indians asked for coats and tools that could be used in hunting, fishing, planting, cooking, and the manufacture of wampum. During the latter decades of the seventeenth century, after most of the land was taken by the English, the relationship between the two cultural communities changed radically. The world of the Unkechaug was in flux when the entries were made in the account books. They had lived in close contact with the rapidly expanding English homesteads on the south shore of Brookhaven for about two decades and were adjusting to their rapidly changing economic and political institutions. 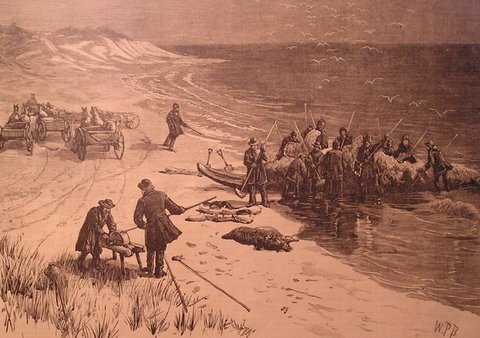 The Setauket settlers began to move south soon after the colony of New York was established in 1664, bringing with them their values, institutions, and material goods. It was the material goods, however, that made the first impact on Native Americans. They saw, for example, the advantages of guns over bows and arrows for hunting and woven goods over animal skins for protection against the environment. The preference for cotton and woolen coats, in particular, had begun in the early seventeenth century. In the first transaction for land in Brookhaven, negotiated in 1655, Sachem Warawakmy asked for ten coats, and a pair of child’s stockings. The Indians called the European explorers who first traded with them “coat men,” or “cloth makers.”. They wanted cloth mittens, coats, britches, and shirts because they could be tailored to fit the body, were colorful, distinctive, served as a symbol of status and could be more easily cleaned. Animal pelts, it should also be noted, became more difficult to obtain as the woodland habitats gave way to grazing lands and the settlers harvested the forests for building materials and for fuel. The beaver were trapped to near extinction for the lucrative European fur trade. This increasing dependence on these and other English manufactured goods is well documented in the ledger. Ten of the thirteen Indians in the ledger received coats. The two women, Tom’s sister and Bumbrest’s wife, took coats and Tom (aka Monogos, var. Meneges) received three, one of which was a large, lined coat valued at one pound, fifteen shillings. The values listed for the coats indicate that there were several different kinds used in the Indian trade. Monogos’s large coat was by far the most expensive; in fact, it was the highest priced item among those allotted to the Indians. Only three of the other coats had prices listed. Monogos’s second coat was only three shillings and Wesquasuk’s son’s and Pomshan’s (var Pemshan) coats were each valued at one pound. Monogos’s second coat was probably made from cotton, but the other two were likely to have been made from duffel, a coarse woolen material produced in Antwerp, Belgium, primarily for the Indian trade. Other items of clothing included five pairs of pants (britches), four pairs of stockings, two shirts, and three pairs of mittens. The ledgers indicate that some of the Indians were now making their own clothing. Cokbis (spelling uncertain), for example, received three and a half yards of cotton in addition to coats and mittens. Pomatitup took home five yards cotton cloth along with a coat and vest and Nawatunname requested three yards of cotton cloth. RFL 1 Ledger, page 2. Courtesy the Huntington Library (original copy) and William Floyd Estate (digital copy), Fire Island National Seashore. The ledgers record significant changes in Native American social structure as well as in material culture. The native people, dependent on European goods, were forced to work under the supervision of their English employers. This must have been difficult for men who were prominent and influential members of their own communities. Bumbrest, for example, whose lay accounts are recorded in the ledger, represented his community in important negotiations with Richard Floyd and Jonathan Rose for grazing rights in 1684 and for planting rights in 1705. Ten of the other Indians also represented their communities in land transactions. John Indian, alias Ryotty, was a signatory on seven deeds or confirmations from 1685 to 1692. The others signed at least one land transaction between 1684 and 1730. Bumbrest entry, RFL 1 Ledger, page 8. Courtesy the Huntington Library (original copy) and William Floyd Estate (digital copy), Fire Island National Seashore. The ledger accounts also underscore the well-documented destructive impact of alcohol on Indian life and culture. The entries provide insights into the patterns of consumption and the use of alcohol as an incentive to recruit and manipulate Indian labor. 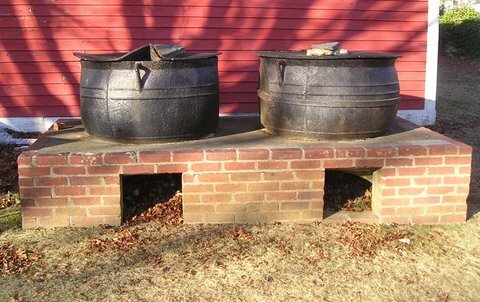 It should be noted, however, that distilled spirits, primarily rum and cider, were consumed in surprisingly large amounts by the English colonists themselves. Although long historical experience with alcohol in European cultures had mitigated some of the destructive impact of drinking, it remained a significant social problem. Protocols enforced by social sanctions in European society limited such patterns as binge drinking that sometimes disrupted Native American communities. The consumption of alcohol by whites during the colonial period was estimated by historians to have been about three pints a week or approximately seven shots a day. The Royal British Navy gave a daily rum ration of one half pints or eight shots to the seamen. Unfortunately the ledgers do not provide specific information about the daily alcohol consumption of the Indians but some general patterns can be discerned. Eighty-five of the alcohol allotments in ledger RFL 1 were for rum, only twelve for cider. Thirty-one of the rum allotments were for one or two gills (5-10 shots) of rum, only slightly larger than the amounts set by the royal navy. These portions were likely consumed during the work day. Larger amounts in pints and quarts must have been carried off, perhaps for distribution in their homesteads or villages. Entries listed for an Indian named Pemshan on June 17, 1689 stand out from the others, suggesting the possibility that he may have been trading rum to other Indians. He acquired a total of nine quarts of rum and a gallon of cider. The Brookhaven freeholders had access to an abundance of rum because of the trade with Barbados plantation owners who needed livestock, corn and agricultural products from Long Island. Another possible source was a rum distillery established on Staten Island in 1664. Alcohol had quickly come to play a major role in the Indian trade because it was an ideal product in any exchange system. The demand remained high and it was quickly consumed, bringing the customer back for more. There were, however, serious related consequences that could not be ignored. Alcohol abuse too often resulted in the disruption of both Indian and English families and communities. The English, however, were primarily concerned about damages to their own persons and property. The governor then added a clause exempting persons who wanted to employ Indians in their whaling operations. These employers “may have the liberty to give them encouragement by affording them some small quantities of strong liquor for their relief and that it be done with such moderation that no discord or abuse do come thereby.” It appears that the Brookhaven residents were operating under this same exemption, but the reference to “some small quantities” raises serious questions about the amounts allotted to Pemshan and some of the other Indians listed in the ledger. Other commodities with a steady demand were powder and shot. Seven of the eleven men in the ledger received a total of seventy-six pounds of shot and twenty pounds of powder. The demand for shot may be related to the entries for feathers credited to the Indians. Feathers were in constant demand for quilts and pillows in English households. The shot was probably small lead pellets rather than the larger musket balls used for deer and other game animals. Corn, another commodity frequently listed in the journal, was requested by five of the men, indicating that the Unkechaug were not producing enough corn to meet their needs. The ledgers are an exciting find that supplement the existing primary sources on the seventeenth century history of Long Island. The dates in the ledger from 1686 to 1690 fill in a gap in the local records relating to seventeenth century whaling. The whaling contracts in the eastern towns begin in 1670 and continue to 1685 (Strong 1989). After the use of contracts was abandoned, individual company owners kept their own records, but few of these have survived. Fortunately William Tangier Smith and his wife, Martha, kept their records of their shore whaling operations from 1697 to 1716 in the “Pigskin Book” which is available to scholars in the Bellport Historical Society archives (1990). The second Floyd ledger from the Huntington collection has entries from 1721 to 1732, thereby completing a sequence of documents from 1670 to 1732. The authors’ preliminary analysis of the data in the ledger led to important insights into interactions among the English residents of Brookhaven in whaling operations. Although we are not able to determine at this time whether the entries are related to the public harvesting of drift whales or to private shore whaling operations, further study of the documents from the prior and subsequent periods and a closer comparative examination of the account book in the Suffolk County Historical Society archive may help to resolve this question. Of equal significance is the contribution to an understanding of the cultural changes within the Unkechaug villages in the Town of Brookhaven. The Indians were becoming more directly involved with the English economic system and increasingly dependent on English manufactured goods. The ledgers document an important economic and political watershed in Native American communities. The sachems were finding that their status and influence was diminishing within their communities and in their relations with the English. During the early contact period the sachems spoke for their people and distributed the goods they received from the land transactions. The English had even strengthened the powers of friendly sachems by giving them access to trade goods and military support. Once the land was gone, however, the European goods had to be obtained by individuals with their own labor. As a result, a new pattern of the primary relationships developed between English employers and individual Indians. The English no longer had any need to cultivate relations with the sachems. Gie, Bumbrest, and Goodger, who were among the Unkechaug sachems at the time, served as menial laborers in the employ of Brookhaven land owners. This new pattern not only undermined the authority of the sachems, but it also forced the Indian workers into a position of dependence on the English. This weakened the Unkechaug’s capacity to protect their tribal and their individual interests. During the years covered in the ledger, the colony was going through tumultuous times. In 1684 Governor Thomas Dongan demanded that the towns on Long Island petition for new patents. This requirement meant that the town had to negotiate confirmations of their earlier Indian deeds and to purchase all the remaining Indian lands within the borders of Brookhaven. This change unsettled the town officials who scrambled to meet with the Unkechaugs to negotiate confirmations of earlier deeds and the purchase of the remaining Indian lands. It would have been an opportune time for the Unkechaug to drive a hard bargain and perhaps even reclaim some of their lands. This did not happen, in part because as the ledgers show many of the Unkechaug depended on their English employers for their economic survival. A good example here is the July 17, 1705 purchase of Acombamack Meadow (cited above) located west of the Carman River near present-day Bellport. Richard Floyd and Jonathan Rose, both of whom are in the RF1 ledger, negotiated the purchase with a group of eight Unkechaugs including Bumbrest (Bumbrost), Pamuntaquaen (Pamutaqua), and John Indian. These three are identified in the ledger as recipients of English goods in payment for services. John Indian, as noted above was among the Indian signatories on seven land transactions, Pamutaqua was involved with three transactions, May 12 and May 29, 1689, and April 29, 1692. Bumbrest signed transactions on May 29, 1689 and June 10, 1690. In the former he is identified as a sachem. 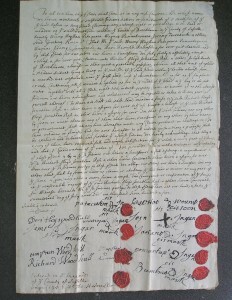 Land deed, purchase of Acombamack Meadow, 1705. Courtesy of William Floyd Estate, Fire Island National Seashore. When the ledgers are placed within the context of the Brookhaven Town records, a clear pattern of vulnerability emerges. Over a period from 1678 to 1718, sixty-five Indians in Brookhaven, including their sachems, were employed by thirty-six Brookhaven freeholders, many of whom were prominent office holders and property owners. These men included John and Thomas Biggs, Samuel Muncy, Ralpf Dayton, Andrew Gibb, John Tooker, John Jenners, William Smith, Richard Floyd, Richard Smith, and Richard Woodhull. Many of these names appear in the ledgers. These were the men who went to negotiate the deed confirmations and purchases that satisfied Governor Dongan’s requirements for the new patents. The ledgers reveal a connection between land dispossession and employer-servant relationships that will help to shed light on a complex, controversial, and poorly understood aspect of colonial history. The Huntington and Suffolk County Historical Society ledgers, therefore, provide scholars with a rich source of data for continuing research. The second ledger, RFL 2 and the Suffolk County Historical Society ledger will be the subjects of continuing research. Kate W. Strong, “Some Early Floyd Papers,” Long Island Forum, Vol. 20 (5): 89, 92. Digital copies of RFL 1 and RFL 2 are located in the William Floyd Estate Archives, at the Fire Island National Seashore, National Park Service, the Suffolk County Historical Society Collections, Riverhead, NY and in the Brookhaven Town Historian’s office, Farmingdale, NY. The original RFAB is in the Suffolk County Historical Society collections. Harriet Stryker-Rodda, “Understanding Colonial Handwriting,” New Jersey History, 1980, 84-88. RFL 1, 31v; 34. There are two undated entries noting that Brewster was credited for “making the county rate.” The other reference to is on page 33v where Richard Floyd, junior is credited with giving John R (Roe) fifty five shillings in full satisfaction for “the rates.” This may have been in reference to an accumulation of rates over a period of time. John A. Strong, “Sharecropping the Sea: Shinnecock Whalers in the Seventeenth Century,” in The Shinnecock Indians: A Culture History edited by Gaynell Stone (Stony Brook: Suffolk County Archaeological Association, 1983), 231-63; Theodore Breen, Imagining the Past :East Hampton Histories (New York: Addison-Wesley Publishing Company, 1989), 155-205. Richard Floyd hired Waupage to hunt whales for him (Kate Strong, Long Island Forum, 1957), 89. Davis hired Mahene, an Unkechaug Indian (Osborn Shaw, ed., Records of the Town of Brookhaven Book B 1679-1756, New York, Derrydale Press, 1932) 175. Samuel Terrill joined a company of six company investors for the 1679-80 season (Joseph Osborne, ed., Records of the Town of East Hampton, Vol. 1 (Sag Harbor: Hunt), 1887), 430-431. 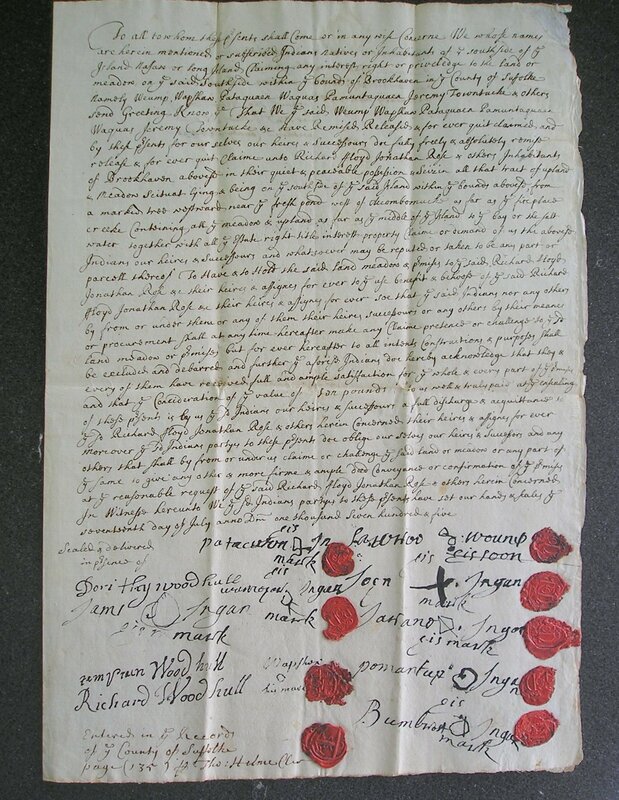 In 1675 Terrill had witnessed a contract signed by Pomshan (Pemeson) Records of East Hampton, 1: 378-79. Chesen signed on with Andrew Gibb of Brookhaven. Records of Brookhaven, Book B: 105. John Indian joined a crew of five Indians to hunt whales for John Rose of Southampton, Southampton Town archives, Southampton Town Clerk’s Office, Southampton, N.Y., Liber A #2:124 , Monogos (Meneges, Menegusth,aka Tom Indian, Honest Tom) hunted whales for John Tooker, in 1685. Records of Brookhaven, Book B: 246, and for Henry Pierson in 1681 Southampton Town archives, Book D:73. Pomshan (Pomanson) hunted whales for Richard Howell in 1679, Southampton Town archives, Liber A#2:122 and for James Loper in 1675, Records of East Hampton, 1: 378-79. Weis (Weeis) hunted whales for Thomas Cooper in 1681, Southampton Town archives, Book D2 1678-93; 71. Brewster Ibid., 4; Muncy Ibid., 6v; Mosier Ibid., 14v. Bernice Marshall, Colonial Hempstead: Long Island Life Under the Dutch and English (Port Washington, NY: Ira J. Friedman, 1962), 116. Silver coins were rare prior 1700 and paper currency was not introduced until 1709. John A. Strong, The Unkechaug Indians of Eastern Long Island (Norman: University of Oklahoma Press, 2011) 40-47. Marshall Joseph Becker, “Matchcoats: Cultural Conservatism and Change in One Aspect of Native American Clothing,”Ethnohistory, 2005, 52(4): 727. Henry Hutchinson, ed., Records of Brookhaven up to 1800, (Patchogue, N.Y.: Patchogue Advance, 1880), 1-2. James Axtell, After Columbus: Essays in the Ethnohistory of Colonial North America (New York: Oxford University Press, 1988) 135-138). Becker, “Matchcoats: Cultural Conservatism…,” 766. Ibid., Pomatitup 24; Nawatunnamo 30v. William Pelletreau, ed., Records of the Town of Southampton, Vol. 5 (Sag Harbor: J.H. Hunt, 1874-77), 301-302. The copy of this contract in the published records is an abstract that does not list the Indian names. The original in the Southampton Town archives (Book 1: 163) includes the names. The 1705 document is in the William Floyd Estate, National Park Service, 20 Washington Ave. Mastic Beach, N,Y, FIIS 9665, Box 1, Folder 6. John’s name or his alias, Ryotty signed the following transactions Nov. 10 1685 (Hutchinson 1880, 69-70); May 12, 1689 (Shaw Notebooks File in Brookhaven Town Historians Office); May 30, 1689 (St George Manor File AF 71); June 10, 1690 (Shaw Notebooks); Dec 8, 1690 (Brookhaven Records Book B 470-71); May 20, 1691 (Shaw Notebooks); April 8, 1692 (Shaw Notebooks). The Shaw Notebooks were transcriptions made by Osborn Shaw and placed in the Brookhaven Town Historians Office in the 1950s. The originals are in the St George Manor archives and are not accessible to the public. Masichics, June 5, 1684 (see citation in footnote 23 above); Pamutaqua, May 12, 1689, (Shaw notebooks) May 29, 1689, (Shaw Notebooks) April 29, 1692, (Suffolk County Historical Society Willits Papers) July 17, 1705 (see # 23 above); Pomshan, May 8, 1687 (Thomas Cooper, ed., Records of the Court of Sessions of Suffolk County in the Province of New York, 1670-1688 (Bowie MD: Heritage Books,1993), 252-54; May 19, 1687 (Ibid., 289-90); Pomatitup (Pomantap), June 10, 1690 (Shaw Notebooks) April 18, 1730 (William Floyd archives FIIS 6928; FIIS 6606). Taccumiclus (Tacum, aka Tachquo) July 2, 1700 (William Floyd Archives FIIS 6606, folder 17); Wesquasuks (Wisquoriake), May 30, 1689 (Shaw Notebooks), Dec, 8, 1690 (Brookhaven Records Book B 470-71), May 20, 1691 (Shaw Notebooks), and April 8, 1692 (Shaw Notebooks). Peter C. Mancall, Deadly Medicine: Indians and Alcohol in Early America (Ithaca: Cornell University Press, 1995); David Murray, Indian Giving: Economies of Power in Indian-White Exchanges (Amherst: University of Massachusetts Press, 2000), 24-28, 109-110; Dwight B. Heath, “American Indians and Alcohol: Epidemiological and Sociocultural Relevance,” in Alcohol Abuse Among U.S. Minorities,” in Danielle L. Spiegler, et., al., National Institute on Alcohol Abuse and Alcoholism Research Monograph no. 18, Rockville MD. 1989. Patricia D. Mail and David R. McDonald, Tulapai to Tokay: A Bibliography of Alcohol Use and Abuse among Native Americans of North America (New Haven: Yale University Press, 1891). William J. Rorabaugh, The Alcoholic Republic: An American Tradition. (New York: Oxford University Press, 1979) 123-146. Ibid., 7-8; Mancall, Deadly Medicine 14. Anthony Blue, The Complete Book of Spirits; A Guide to their Production and Enjoyment (NY: Harper 2004), 73-74. Lead shot molds found in a seventeenth century Wampanoag burial ground could produce two different sizes of shot. Susan Gibson Burr’s Hill: A Seventeenth Century Wampanaog Burial, Warren Rhode Island (Haffenreffen Museum of Anthropology, Brown University, 1980). John A. Strong, A Fatal Friendship: Lion Gardiner and Wyandanch, Sachem of the Montauketts, in Origins of the Past: The Story of Montauk and Gardiner’s Island, Thomas Twomey, ed. (Bridgehampton: East End Press, 2013) 147-195. Cited above in footnote number 23. May 29, 1689 (Brookhaven Town Historians Office files under Seventeenth Century documents); May 12, 1689 (Shaw Notebooks); April 29, 1692 (Suffolk County Historical Society archives, Willets Family Papers). May 29, 1689(aka Washaquoheg) He is identified here as a sachem (Brookhaven Town Historians Office under Seventeenth Century Documents). June 10, 1690, Bumbrest (Shaw Notebooks).